Beth Dooley: READ THIS.... and eat! Atina Diffley's memoir is fresh off the press. But, be warned, while the reviews thus far are glowing there have been troubling stories reported by readers. One person turned the kettle on high, started reading and forgot until hours later when smoke was pouring out of the kitchen, another forgot to pick his kids up from daycare, another laughed so long and so hard, she couldn't get in the car and was late for work. Deborah Madison (James Beard award winning chef and cookbook author) said, "I read it in the bath til the water turned cold and I didn't even notice. 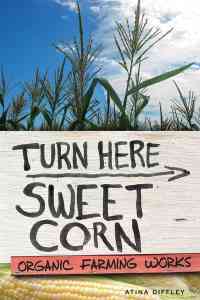 Turn Here Sweet Corn: Organic Farming Works is a story of relationships -- with the land, plants and animals, families and communities, ourselves and our deepest desires. A master class in organic farming, a lesson in entrepreneurship, a love story, a legal thriller, it's a book I will pick up again and again and agin. Its a story of resilience and hope; it's a must read for anyone who understands food matters. I want to read this. Thanks for the great tip, Beth!